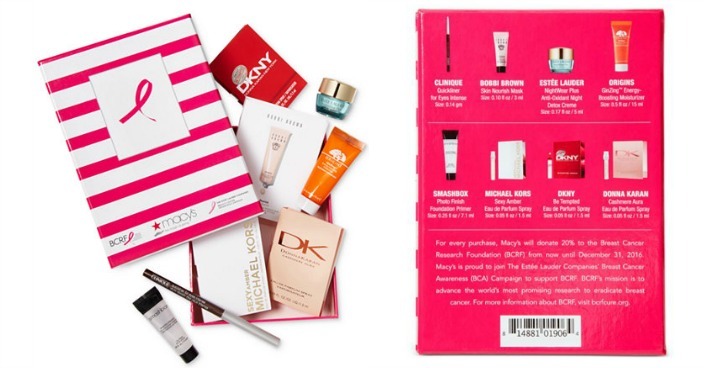 Macy's 8-Pc. Beauty Sampler Set Only $10! Down From $20! You are here: Home / Great Deals / Macy’s 8-Pc. Beauty Sampler Set Only $10! Down From $20! Macy’s 8-Pc. Beauty Sampler Set Only $10! Down From $20! Macy’s has this Macy’s 8-Pc. Beauty Sampler Set on sale for $10 (Reg. $20)! In honor of Breast Cancer Awareness Month, Macy’s is proud to join The Estée Lauder Companies’ Breast Cancer Awareness (BCA) Campaign to support Breast Cancer Research Foundation (BCRF) through the sale of the BCRF Beauty Sampler. Macy’s will donate 20% to BCRF from now until December 31st.